Most companies implement cloud solutions with an enterprise software mindset, and once these solutions are in place, they continue to manage them with the same approach. As a result, they often neglect to put in place the processes and resources necessary to enable continual innovation—and they fail to seize opportunities to enhance their applications after their initial go-live. Bluewolf estimates that 80 to 90 percent of salesforce.com customers could be achieving significantly higher returns in their first year after go-live by changing how they manage the application. In addition, ten to 15 percent of those customers are actually significantly diminishing their original ROI by failing to keep the application at pace with business change. after working with thousands of salesforce.com clients, Bluewolf has identified what separates the salesforce.com leaders from the mere players. 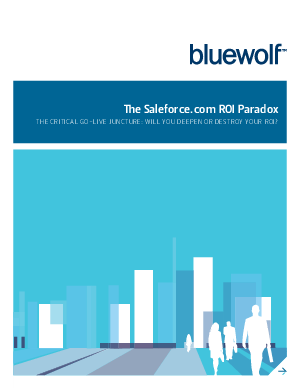 In this whitepaper, Bluewolf lays out the steps companies can take to increase their salesforce.com sophistication and maximize their ROI.